Are you looking for a weather-proof sight-screen for your balcony, garden, patio or terrace? The SolRoyal® balcony screening SolVision is 3 m long (approx. 10 ft) and 90 cm high (approx 3 ft) making it an ideal windbreak for your home. This weather-resistant, mildew and rotproof privacy screen is easy to clean and virtually maintenance-free. 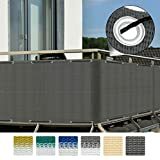 It is a tear-proof cover offering wind, sun and UV protection, and is easy to fasten to your balcony railing with a 12 m fixing cord and the cable binders included in the scope of delivery. It has metal eyelets sewn in every 30 cm to ensure durability and safe fixing. The balcony screen is made of 100% durable polyethylene enhancing ist windscreen properties. Whether you want it self-coloured or bi-coloured, small or large – we offer the Sol Royal visual-protection in various colours and sizes. It shields from wind and sun and increases privacy on the patio, balcony, garden, porch or deck. The balcony screening by Sol Royal® is a perfect privacy protection, blocking sun and wind and protecting you from prying eyes. It comes in two lengths, 5 m (approx. 16 ft) or 3 m (approx 10 ft), and has a height of 90 cm (approx. 3 ft). The windbreak is simple to attache to or remove from your balcony and allow versatile use. It is made of high quality materials, guaranteeing a long life expectancy, and is offered in various colours to choose from. The balcony screen has durable metal eyelets sewn in 30 cm apart, making it tear-resistant and durable. A 12 m fixing cord and 26 cable binders are included in the scope of delivery, so you won’t need any additional fixing materials, and can simply attache it to your balcony railing. It hides areas of the garden which requires screening or sun shelter / shade. The Sol Royal® screening is easy to install and can be cut or trimmed to suit any setting.